For a smart casual getup, reach for a Robert Talbott tailored fit stripe dress shirt from Nordstrom and a brown gingham wool blazer — these two items fit brilliantly together. 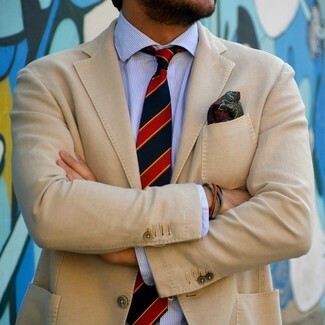 This combo of a white and blue vertical striped dress shirt and a tan blazer is super easy to put together in no time, helping you look amazing and ready for anything without spending a ton of time combing through your closet. 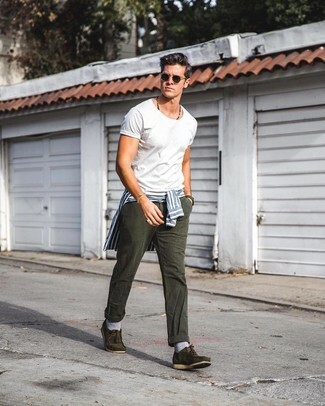 Such staples as a white and blue vertical striped dress shirt and charcoal jeans are the perfect way to introduce extra elegance into your day-to-day casual lineup. To inject a playful feel into this ensemble, complement this ensemble with olive suede boat shoes. 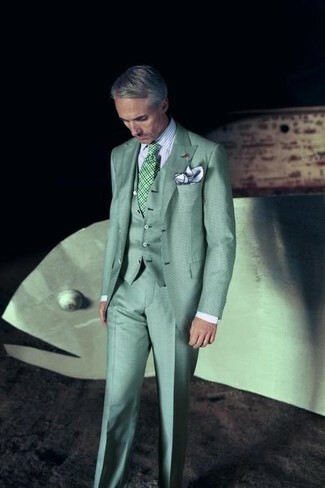 Dress in a Robert Talbott tailored fit stripe dress shirt and mint dress pants for a sharp, fashionable look. 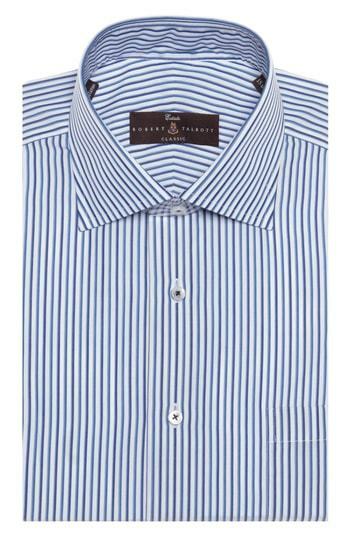 Wear a white and blue vertical striped dress shirt with khaki dress pants for a classic and refined silhouette. Go for a pair of grey athletic shoes to make the outfit current. 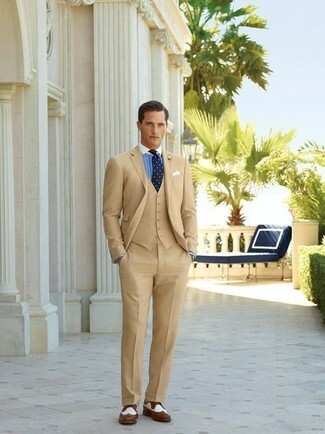 Marry a Robert Talbott tailored fit stripe dress shirt from Nordstrom with khaki dress pants like a true gent. 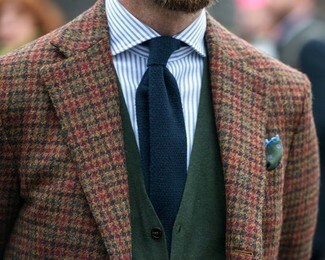 For something more on the daring side to finish off this getup, grab a pair of white and brown leather brogues. 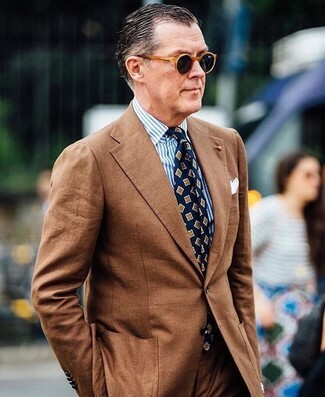 For a nothing less than incredibly stylish getup, pair a Robert Talbott tailored fit stripe dress shirt with a brown suit. 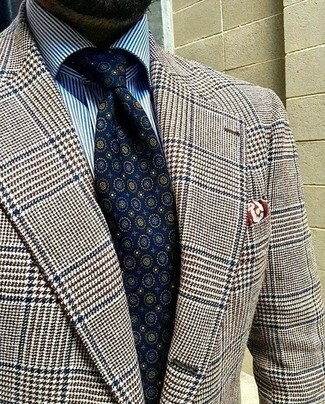 For a smart casual outfit, consider teaming a white and blue vertical striped dress shirt with a brown houndstooth wool blazer — these two pieces go perfectly well together. 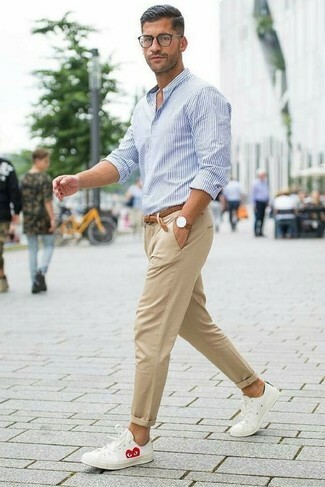 This pairing of a white and blue vertical striped dress shirt and khaki chinos is super easy to pull together without a second thought, helping you look sharp and ready for anything without spending too much time searching through your closet. For something more on the daring side to complement this ensemble, grab a pair of white leather low top sneakers.